The Downtown lifestyle you are looking for! Tarleton Square, built in 1967, was designed with Jeffersonian architecture in mind to honor the beauty of Monticello, the local home of Thomas Jefferson. 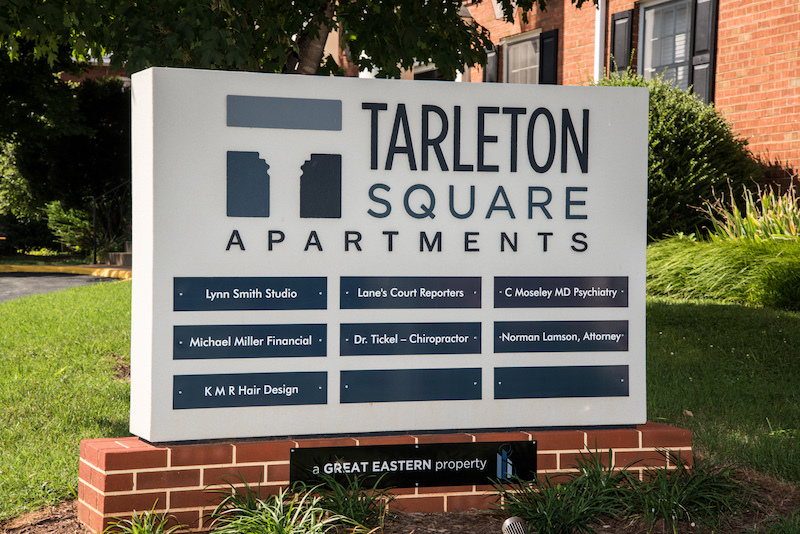 Tarleton Square is a four story mixed-use building just one block away from the Historic Downtown Mall of Charlottesville. With such an ideal location, it is no surprise that when apartments do come available they do not stay available for long. Not only does Tarleton Square have 52 residential units, there are also 20 office suites for commercial use on the terrace level. Great Eastern Management Company acquired Tarleton Square in 1981, and since then has given the building several facelifts to enhance the beauty of the original architecture. Several residential units have also been renovated, hallways have been refurbished, and most recently the foyer has been completely redone to include hardwood floors, modern furnishings and new sitting areas for light conversation or for game night with friends, complete with a fun selection of provided games. Tarleton Square is a secured, electronic access only building. Each resident is provided with their own unique code for access to all entrance doors to the building. Other amenities of the building include a fitness center, centralized mail room, on-site laundry facilities, and a large front porch and front patio to mingle and get to know your neighbors. On-site maintenance and 24 hour emergency maintenance are also a perk of living at Tarleton. Our maintenance staff embodies experience and devotion to solving any issues that may arise. Stop by the leasing office located at 2619 Hydraulic Road or just give us a call to learn more about the one and two bedroom apartments or about leasing an office suite! Great Eastern Management Company also operates three amazing shopping centers in the heart of Charlottesville! These include Seminole Square Shopping Center, Pantops Shopping Center, and the Blue Ridge Shopping Center in Crozet. As an added bonus for choosing Tarleton Square, you will receive a $200 shopping spree and $100 in gift cards to these shopping centers! Call the office to ask about how YOU can receive these specials TODAY!